The small and lovely town of Hanalei is located on the North Shore of Kauai and has been used as the setting for many popular films. It's not difficult to see why Hollywood chooses to shoot scenically-beautiful movies like Jurassic Park, Avatar, and Tropic Thunder were shot in and around the Hanalei area. That beauty— that the town and its beaches have—has created a demand for property. With buyers from all over the world flocking to the Northern parts of the island to explore the Hanalei real estate market. The town is complete with a mixture of farmers, easy-going locals, tourists, and artists. Hanalei as a whole walks the fine line between old and new with skill and is one of the few areas in the world that finds the ideal balance between preservation and rejuvenation. Similar to Princeville, Kapaa, and Poipu, neighborhoods in Hanalei are highly recognized for their exclusivity and beachfront properties. If you’re interested in purchasing property on Kauai, Hanalei real estate offers unique and tropical homes, perfect for your family getaway. Beautiful beaches, a relaxed ambiance, local influence, and ultra-luxury homes present a variety of attractive lifestyle options for buyers searching for their dream Hawaiian home. Hanalei’s intimate community is a quaint town filled with many large oceanfront residences. 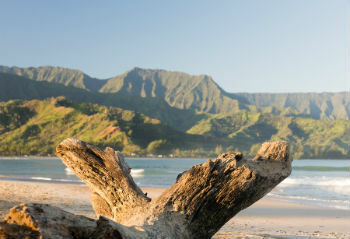 With the crystal blue oceans and white sandy shores awaiting homebuyers in Hanalei, it’s no wonder that this town’s real estate market is thriving. Many of the Hanalei homes for sale have 180-degree ocean views and are within walking distance to the famous Princeville and Hanalei Bay, a beach that is staffed by lifeguards year round. With lush palm trees and gardens, these properties are the picturesque tropical paradise that buyers dream about. Unique architecture and unparalleled ocean views make these homes some of the most sought after real estate on the island and the properties are not usually on the market for very long. Properties in Hanalei are designed to enhance and embrace the natural beauty of the island and therefore, define luxury living in Kauai. Most of the Hanalei homes for sale have beautiful interiors with custom adornments, floor to ceiling windows, salt water infinity pools and vaulted ceilings. Tourists visit this lush and quaint town and often choose to stay and invest in Hanalei, Kauai real estate. Get Hanalei Real Estate Listings Before Your Competition! When you choose Anne Eliason as your Kauai real estate agent, you'll get everything you need to make your online home search a success. You'll see listings before anyone else, be able to create custom searches and bookmark your favorite homes. Why Invest in Hanalei Real Estate? Unfortunately Hanalei real estate is not zoned in the Visitor Destination Area (or VDA, for short). However, there are a selection of homes that are scattered throughout the town of Hanalei that are “grandfathered in”, which means that are legally allowed to rent their properties out for vacation home purposes. The VDA was implemented after the former permit-based system known as Transient Vacation Rental (TVR) permits were scrapped. In order to be able to access the benefits of the TVR permit when you purchase a Hanalei home for sale, you should contact a real estate professional that is experienced. Graced with timeless beauty, the small town of Hanalei is complete with many museums and art galleries, which are popular tourist attractions that pay respects to the town’s rich history. Hanalei is also well-known for its lush taro fields, making the jungles look like large green blankets that envelope the surrounding land. For the nights that you simply cannot face rustling something up for yourself, you'll be thrilled with the abundance of choices that await you in Hanalei. From the top-rated Bouchons, which serves up fresh seafood, to the gluten-free options of the highly rated Trucking Delicious, the food scene in Hanalei will knock your socks off. For a more formal ambiance, head down to the nearby Princeville and enjoy island-inspired dishes at the ever-popular St Regis Resort-Princeville. The perfect spot for meat-eaters, the St Regis Resort's most popular dishes include the lamb, beef tenderloin, and ribeye steaks. Once you're finished your meal, take a stroll along the Puu Poa Beach and enjoy the soft lapping of the ocean. Partaking in a variety of watersports including scuba diving, snorkeling, paddle boarding, and surfing. Ready to discover Hanalei homes for sale? Contact us and we'll start your Hanalei real estate search today!